Happy Monday, y'all.. or happy "first day Caroline doesn't have work" day! All I can say is that after this weekend, I am SO glad I don't have work today because there was no way I was making it to work today in one piece. I feel so mashed up! 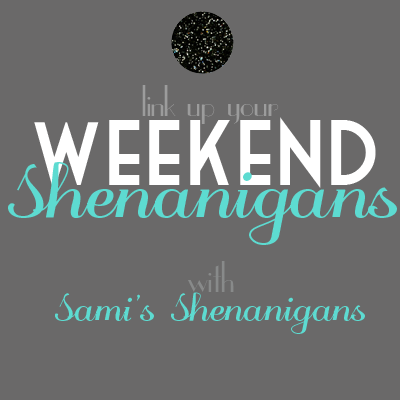 So after having a pretty great weekend, I figured I'd finally bite the bullet and link up with Sami and all of her crazy amazing friends and their stories! I'm also adding pictures to this post. Real pictures. That never happens, so this is amazing! But Saturday is when all the shenanigans unfolded.. My best friend K and her two siblings decided to throw a booze cruise for their birthdays. 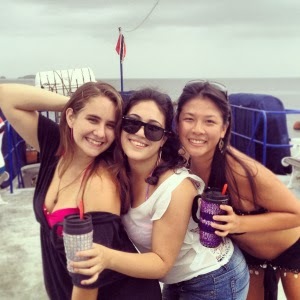 If you don't know what a booze cruise is, you haven't lived. 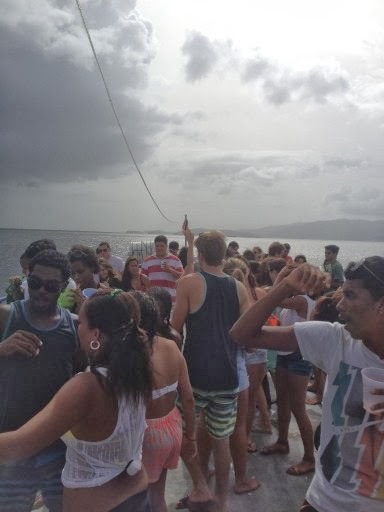 It's essentially a huge party boat with lots of booze and we cruise around the island. Yep, pretty self-explanatory, no? Well, if you want to picture what this particular booze cruise looked like, then think all of my favorite people on a boat in the middle of the ocean with a DJ and amazing weather, and 5 huge bottles of Puncheon and Malibu mixed (read: the most lethal combination ever..) and then just try to picture my state. (...and that we did!) Need evidence, you say..? Look no further! L, myself and K - obviously pre-party! This was basically all we did - drink on a boat from 12 to about 7pm. 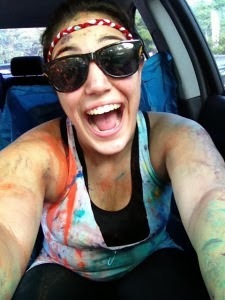 As if my legs weren't already hurting from dancing all day, I conveniently signed up for a Color Run the next morning. 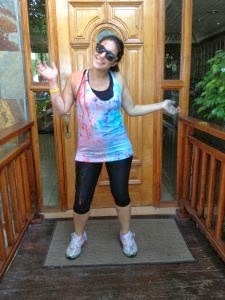 It's not exactly like the color runs they have in the US, because this one was a little smaller and put on by a charity to raise awareness for a cause they'll be promoting for the rest of the year. I wasn't too pleased about the 7am start time, and my hangover headache was there to remind me. I mean, you would think that after that I'd had enough? Nope.. I went home, took an hour-long shower (I'm not even kidding - the paint would NOT come off!) 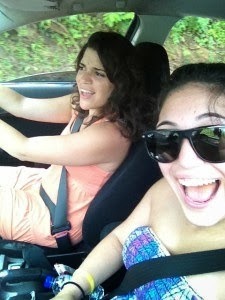 and then we headed to the beach.. because what else do you do when you live in the Caribbean? After getting some fresh air and eating some shark and bake (and I know none of y'all have ever heard of shark and bake, but it's fried shark, and fried dough that makes bake - and you put any condiment you could imagine on it and it is essentially the best food ever created in life! Even the Culinary Institute of America thinks so!) And I think this finally cured my 'headache' and I was good to go. 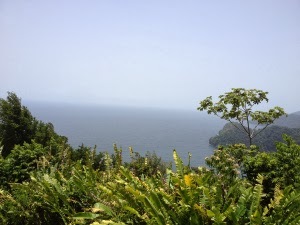 On our way back, we stopped at the "lookout" to take a get some snacks for the ride back, and snapped some photos of the view of the coastline. I got home, slept for three hours and then watched the Kardashians and all their over-dramatic family drama that I love, and today I can't walk or feel my back. I blame the 5K, my sister blames the alcohol. It's always the alcohol.. So, there was my weekend. I'm gonna list my shenanigans, mingle and gossip a little bit, and hope you decide to join in too!